This blog post does not constitute legal advice, nor is this information intended to create or rise to the level of an attorney-client relationship. You should seek professional legal advice where appropriate. GDPR takes effect on May 25, 2018, replacing the existing Data Protection Directive 95/46/EC in order to harmonise data privacy laws across Europe (including the U.K.), to protect and empower all EU citizens data privacy and to reshape the way organisations across the region approach data privacy. It will affect all EU organisations as well as organisations outside of the EU that offer goods or services to, or process personal data of, EU data subjects. Organizations in non-compliance may face heavy fines (up to 4% of annual global turnover or €20 Million, whichever is greater). The GDPR establishes a clear distinction between directly identifying information and pseudonymous data. It encourages the use of pseudonymous information and expressly provides that “the application of pseudonymisation to personal data can reduce the risks to the data subjects concerned and help controllers and processors to meet their data-protection obligations”. What is a data controller and a data processor? A company/organisation that collects people’s personal data and makes decisions about what to do with it. So if you’re collecting personal data and are determining how it will be processed, you’re the Controller of that data and must comply with applicable data privacy legislation accordingly. A company/organisation that helps a controller by “processing” data based on its instructions, but doesn’t decide what to do with data. A controller is the entity that determines the purposes, conditions and means of the processing of personal data, while the processor is an entity which processes personal data on behalf of the controller. What is the role of ExoClick in GDPR context? As an ad network and ad exchange, ExoClick acts as a co-data controller, together with our Publishers. What is ExoClick doing about it? ExoClick has been preparing for GDPR since 2017. We have been reviewing our data security and data protection protocols and policies across the company to comply with GDPR requirements. More concretely we respect and apply the data minimization principle, making sure that we don’t collect more information than what is strictly necessary for the purpose of our services. Also, we only use pseudonymous data which cannot lead to the personal identification of a European subject, ExoClick is not able to know the identity of the user. Finally, we are applying the privacy-by-design concept, which consist of taking into account data privacy throughout the whole engineering process. What personal data is ExoClick using? Is ExoClick compliant with GDPR? In our standard terms with partners and clients, ExoClick always undertakes to comply with all applicable laws and regulations. This of course covers GDPR. We have always innovated and followed industry best practices, standards and regulations. Data privacy has always been part of our priorities. 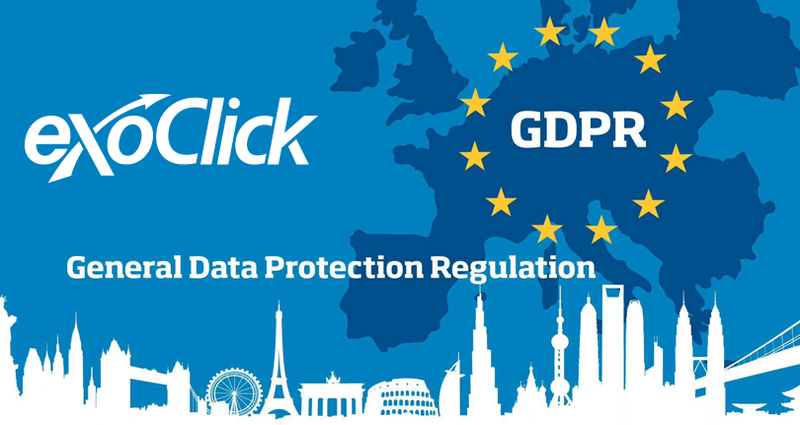 ExoClick is committed to helping you understand and prepare for the General Data Protection Regulation (GDPR) and more posts and information will be published soon.